Alchemy Systems helps leading brands create front-line worker expertise in the food industry and establish a safer and more productive workforce with an innovative technology suite. Through training, coaching, communications, and creating educational videos, they implement inventive solutions to maintain safety requirements and increase operational excellence for premiere brands in the food industry such as Kraft, Nestle, and Kellogg’s. Alchemy Systems creates food and safety videos, manuals, and training materials for top global brands. Before working with Modula4, Alchemy Systems did not have a DAM system and needed a way to manage their print materials, production files and thousands of videos, and to increase efficiency of their video workflow. Additionally, they wanted to be able to distribute their production materials to their creative team and users within their office in Austin, TX and Guelph, Ontario, Canada. Modula4 created the foundation of a more efficient workflow for Alchemy Systems by implementing a Cumulus DAM (Digital Asset Management) system. Products from Modula4 including Web Module, Video Module, and Productivity Pack were deployed to help Alchemy Systems distribute and share their production materials. With Video Module, users can preview and add comments to videos, and download them more quickly. Video Module also helps Alchemy Systems save time and disk space by no longer requiring that videos be transcoded at ingest. Productivity Pack allows users to efficiently perform bulk actions such as uploading and metadata editing in a web browser. Modula4 also created a customization for Alchemy Systems, that supports automated rights management and improved version control that restricts who can edit or download specific files. With the Smart Asset Download customization, assets are synchronized between offices in Texas and Canada, Web Module detects the users’ location, and pulls the asset from the nearest file server. The customization has reduced download times dramatically and created a more seamless workflow solution. Now the marketing department has access to Alchemy Systems’ entire image library. Users can also search for assets across catalogs, and based on their location, gain access to saved searches. It’s also easier to pre-filter for assets that are available for different clients or project conditions and requirements. With a DAM system in place, Alchemy Systems enjoys significant time-savings in their video and print production workflows. The combination of Video Module, the Smart Asset Download customization, Productivity Pack, and Web Module have made it easier to find, share and use their assets. Additionally, they have greatly improved permissions control, version control and rights management. 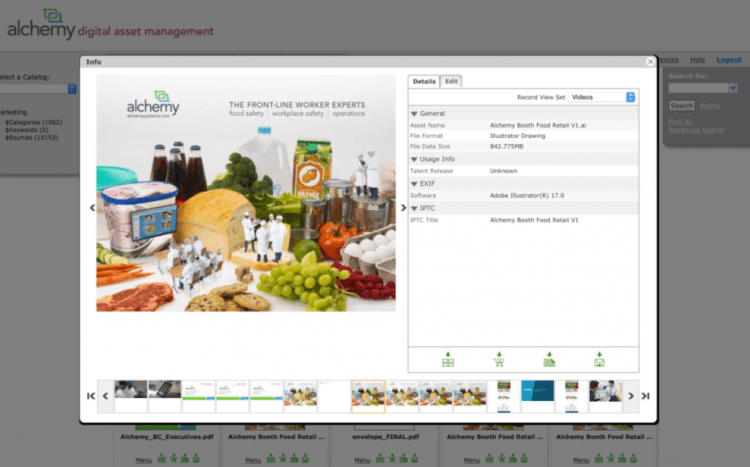 Alchemy Systems is able to distribute their production materials to their creative team and other users, streamlining the process of creating quality solutions for leading brands in the food industry.